The Book Rat: Lady Susan, Master Manipulator | guest post from Maria Grace! 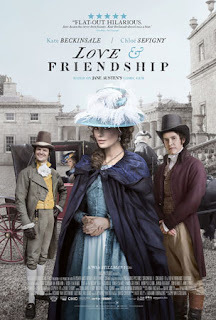 Lady Susan, the Jane Austen novella recently adapted into the film Love and Friendship is unique among all of Austen's works, for many reasons. Not the least of which is that it's something of a Regency train wreck. You just can't tear yourself away from the awfulness that is Lady Susan. Don't get me wrong, I love the original novella, and I thought the movie was excellent. But, man does it leave me wondering who Jane Austen hung out with. Lacking access to psychiatric textbooks, the internet, or even a local psychiatrist--Freud wouldn't be born for another 40-50 years yet--the only way Jane Austen could have so vividly, and accurately portrayed the narcissistic, sociopathic Lady Susan was to know someone just like her. But who? I don't think it was someone she lived with. Living with someone like Lady Susan, who displays a pretty significant personality disorder, is an experience like no other. People like her are apt to go about the world manipulating half the people around them to do their bidding whilst the other half question their own sanity. In short they make people crazy. Lady Vernon and her brother, also in the wake of Lady Susan. Seriously those with personality disorders are convinced they are the sane, sensible ones and everyone, absolutely everyone, else around them are the ones with the problem. (We won't talk about how I know this. That's another blog post.) Obviously, Jane Austen knew something of that, but she didn't portray Lady Vernon or Frederica with quite the right level of intensity to suggest she knew first-hand the way these people mark one's soul. Still though, she nailed the way Lady Susan manipulated both the men around her and her friends, like Alicia. I have a hunch, Austen watched someone in her circle do just that. All in all, it just leaves me in awe of how astute Austen must have been at a very young age--Lady Susan was among her earliest works--to pick up on what most people never catch on to, not to mention portray it so accurately on the page. I wonder if this isn't some of the reason Lady Susan is not one of her more popular works. 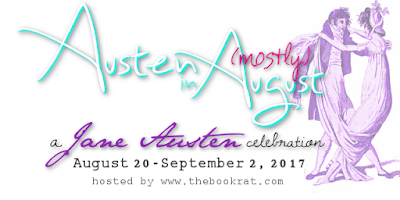 Fredricka gets her love, romance and happy ending--all the hallmarks of an Austen tale. But Lady Susan, like Wickham, Willoughby, and William Elliot (what is it with the 'W' villians here?) remains steadfastly unredeemed. Sad, frustrating, and a little unsatisfying, but entirely realistic. Those like Lady Susan very rarely make a change for the better. Did Austen see that, too? Maybe, after writing Lady Susan and her manipulations, Austen found herself weary of spending so much time in the head--and heart--of such a character and reoriented herself toward the characters we love-to-love rather than the ones we love-to-hate. I tend to think the rushed ending of the original novel points to this. I heartily recommend Love and Friendship, just be warned it isn't the typical Austen tale. The 'title' character is the villainess, not the heroine here. On a more personal note, if you have lived with or been significantly impacted by someone with a real personality disorder (not just garden variety difficult sort of person) you might want to really think about seeing this film or even reading the book. It could bring up some rather difficult 'stuff'. If you'd like to read Lady Susan for yourself, come by my website, RandomBitsofFascination.com and download a free copy of Lady Susan. Be careful though, because once you pick it up, you won’t want to put it down. You can contact Maria Grace at: author.MariaGrace@gmail.com. I have seen the film and cringe, not just when she says something, but when I see her in the scene in anticipation of what she is going to say when she opens her mouth. I think she is my least favorite Austen character...maybe because she is so upfront about it...not at all subtle as her other villains are. Looking forward to the group watch for this movie. Thank you for your take on her, Maria. Thanks for hostessing, Misty. I'm looking forward to it, too! I think she's going to provide a lot of fodder for our discussion. Thank you! 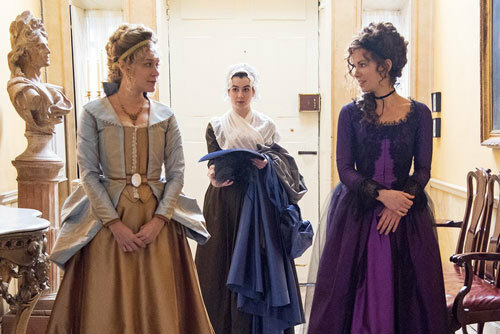 I so enjoyed Love & Friendship. It hits all the same notes Jane Austen struck in Lady Susan. It is an excellent assumption that Jane encountered at least one lady who misplaced her conscience and did not miss it at all. Lovely post. Wishing you and yours safety during the coming storm. "lady who misplaced her conscience and did not miss it " Ha! I've seen a few scholars speculate that it was a certain older relation that Jane used as her model because the woman could be manipulative and spiteful. I agree that she had to have met such a person to write such a character. Great discussion. Don't you just wish you could be a fly on the wall sometimes?